On the new Win2012 server box, joining the domain as a server that is a member of the domain worked fine. But the AD DS Cfg Wiz freezes for about 100 seconds, it goes from page 1 of the wizard to page 2 (which shows site name combo box and two password entry edit boxes for DSRM password) then I get this error in Active Directory Domain Services Configuration wizard. A domain controller running Windows Server 2008, Windows Server 2008 R2, or Windows Server 2012 could not be located in this domain. To install a read-only domain controller, the domain must have a domain controller running Windows Server 2008, Windows Server 2008 R2, or Windows Server 2012. Next I get a few more similar "You can't check this checkbox so we've grayed it out for you" messages that you can continue past. Has anyone gotten a Domain at 2003 level up to 2012? Update Turns out I had no active schema master on the domain. Is your forest/domain functional level at 2003? You should be able to add a 2012 domain controller into a 2003 forest - provided the forest is at the 2003 functional level. edit2: If you are trying to install a RODC, you will need to have a 2008 writable DC to install a read-only DC. 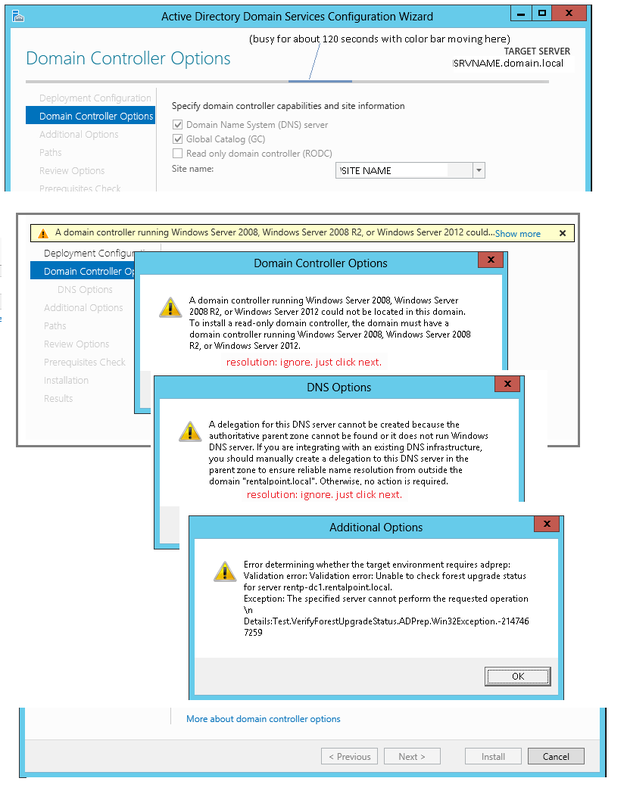 The only situation where you'll need at least a Windows Server 2008 DC is if you're adding a read-only domain controller. If the message you are getting is the one shown here, then it's only a warning (as should be clear from the yellow exclamation point icon); it will not stop you from continuing, unless you're actually trying to install a RODC. You need to run the requisite adprep /forestprep and adprep /domainprep commands from the 2012 DVD. It turns out I had no active Schema Master on my domain. I asked here about how to get the active schema owner. The name was valid but the machine name was a name that had long since been powered down and decommissioned, but nobody transferred the schema master role before it died. While windows server 2012 tries to save you from running adprep, it can't do it in some cases. In my case, someone had created a domain controller and transferred the PDC role to a server but not the schema master role, then retired the schema master server without transferring the schema master role normally. Diagnosing issues like this, when moving up from a 9 year old version of windows to the latest version, is hard because in Windows Server 2012, you get Win32 errors and these errors are just large negative integer values as shown in my question. But even attempts to upgrade from 2003 to 2008 R2 were similarly blocked, and no helpful error messages were displayed. Of course that's typical for ActiveDirectory issues. Reading logs and running command line diagnostic utilities is part of the standard "flow chart for troubleshooting" if you go look on TechNet. It's a giant tar-pit of accidental complexity. In cases like the above, you only get useful errors when you run AdPrep in standalone mode. Sadly, only 64 bit adprep comes with windows server 2012. use 2008 r2 install dvd to get 32 bit adprep32.exe. As I said in step 1, most people won't have this problem, but the confusion in amateur-IT circles may lead others to having similar problems. Remove Symantec Endpoint Protection and Disable Windows Firewall, so that WMI works over the network, which is required for the new domain controller talking to the old domain controller. Repair a few DNS configuration errors and then run ipconfig /flushdns, including removing decomissioned servers that had not been properly decomissioned which means basically going to the AD management screen and deleting those servers. Other DNS errors might include lack of reverse-DNS records, etc. Ensure that if you get errors communicating via WMI/DCOM that you repair the service permissions or other errors that can block WMI and DCOM from working. For me, this issue happened due to a failed seizure of the naming master. I had to re-seize the domain master role again to resolve this issue. I discovered that something was up when I ran the "netdom query fsmo" command and it gave me an error after the first role trying to enumerate all the FSMO roles. I was able to check the FSMO roles individually in Active Directory Computers and Users and Active Directory Domains and Trusts. When I was checking the Domain Naming Master in AD Domains and Trusts it wasn't able to list the current Domain Naming Master and consequently didn't let me change it to the server. I then followed the steps layed out on "https://technet.microsoft.com/en-us/library/cc816779(v=ws.10).aspx" to seize the naming master Worked like a charm! It seems the error points to a network connectivity issue between the new DC being promoted and the existing DCs on the domain. I had the same error "error determining whether the target environment requires adprep". This was caused by the schema master being on a different site and the firewall between was not allowing the new DC to connect to it. Once the flow had been added to the firewall for the new server the error went and the promotion to DC went forward without incident. This can happen when you rename a DC during a migration. Best Practices would be to install DNS first then you shouldn't see this error. Hack around is to choose remove role, it will fail, close and the error will be removed. Not the answer you're looking for? Browse other questions tagged active-directory windows-server-2012 or ask your own question. How do I detect ActiveDirectory Schema master from the command line in Windows Server 2003 and WS2k3R2? How do I add a Windows 2003 Domain Controller to a Windows 2000 Forest?